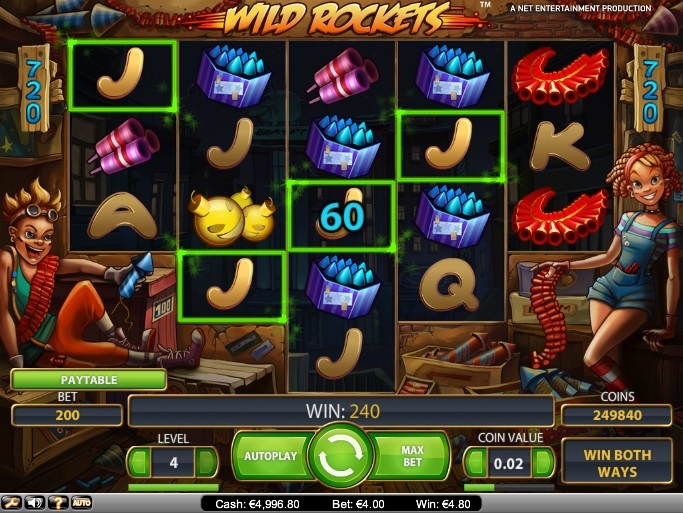 Wild Rockets is Net Entertainment’s (NetEnt) fireworks themed online video slot. Although it has a small fixed jackpot of 250 coins, it offers up to 50 free games and scatter payouts of up to x200, which translate into really huge wins. Since Wild Rockets has 720 ways to win, players do not have to activate any paylines manually. But they are required to place bets in the range of $0.50 to $100.00. The slot allows players to bet up to four coins and choose from a coin value range of $0.01 to $0.50. Once players have placed their bets, they can hit the Spin option, create winning combinations, and win really big prizes. Since Wild Rockets is a NetEnt slot, it comes with the Skill Stop Feature, which players can use to stop the spinning reels in order to capture a winning combination and win extra payouts. There is also an Autoplay Feature, which players can use to spin the reels automatically. Players can also customize their gaming experience by turning the audio effects and background music on or off, view their gaming history, and change the graphics quality. NetEnt’s Wild Rockets is based on the theme of fireworks. The slot is a splash of brilliant colors against a dark backdrop, reminding players of a fireworks show. The reels feature icons of firework such as bottle rockets, bloom fountains, spinner wheels, smoke bombs, and firework clusters, along with icons of aces, kings, queens, jacks, and tens. The Wild Rockets icon in case of Wild Rockets serves as the joker, helping players complete winning combinations by substituting for all the other symbols across the reels except the scatters. However, the wild icons appear only on the second, third, and fourth reels. The Box of Fireworks icon is the scatter. Combinations of scatters pay even if they do not land along an active payline. If players land 3, 4, or 5 scatter icons anywhere on the reels, they will win attractive scatter payouts of x2, x20, and x200, respectively. Players can unlock the free spins round by landing at least three Box of Fireworks scatters anywhere on the reels. If players hit combinations of 3, 4, or 5 scatters, they will win 10, 20, or 50 free games, respectively. This feature can be re-activated while playing a free game. To win the top fixed jackpot of 250 coins, players must land five Bloom Fountain icons. If players want to celebrate with fireworks from the comforts of home, Wild Rockets is the best slot for them. The slot is available for fun or real money at any online casino that operates on the NetEnt software platform. It can be played directly from one’s browser.